There was a major shakeup in SI.com's Heisman Trophy watch after three of the nation's top four teams suffered losses in Week 11. Week 11 put the lie to the notion that this college football season would crawl to a boring conclusion. Five of the top 10 teams in the AP Top 25 Poll suffered losses, including squads ranked No. 2, No. 3 and No. 4. The next set of College Football Playoff rankings won’t be released until later Tuesday, but rest assured Saturday’s results will cause no small amount of reshuffling below presumed No. 1 Alabama. If the losses by Clemson, Michigan and Washington left the national team hierarchy in flux, they rocked the Heisman Trophy pecking order to its foundation. Louisville quarterback Lamar Jackson retained the top spot, but not without a close shave in a home game against a middling conference opponent. Meanwhile, two upsets cluttered the pack of players trying to narrow the yawning gulf in his wake. Washington passer Jake Browning and Clemson passer Deshaun Watson, A-list candidates leading teams with playoff aspirations, are in a precarious position after foundering in games that looked like prime opportunities to solidify their cases for invitations to New York. On the other hand, another signal caller heading a CFP contender played the best football of his college career in a 48-point rout of an inferior opponent, and two guys who placed in the top five of the 2015 and 2014 Heisman races, respectively, polished their résumés in comfortable victories. There are no new faces in the Watch’s top five, but a couple of players from the Pac-12, including one preseason favorite, earned spots in the Honorable Mention section. Anyone who tuned into watch Jackson for the first time this season on Saturday might have come away wondering what all the fuss is about. He was totally mediocre in a 44–12 win over Wake Forest, logging the sort of statistical line (298 total yards, one touchdown) most competent dual-threat starters could produce in a conference game. Of course, Jackson is much more than a merely competent quarterback, which helps to explain why that performance won’t erode his Heisman stock. If anything, it probably strengthened it: By avoiding a loss on a day when two of his top three competitors (Browning, Watson) could not do the same, Jackson broadened his lead at the front of the race. Jackson may have already clinched the award, but voters still considering other players will have a chance to watch him in a compelling matchup with another electric triggerman Thursday night when the Cardinals face Houston and quarterback Greg Ward Jr. at TDECU Stadium. During the early part of this season, this game looked like a potential playoff eliminator for both teams as well as a showdown between two top Heisman candidates. The stakes for the Cougars and Ward Jr. are much lower now, but they can still torpedo the Cardinals’ CFP chances and, at the very least, sow doubt over Jackson’s position as the undisputed leader in the race. Mayfield overtook Browning as the nation’s most efficient passer on Saturday after lighting up the Big 12’s second-ranked pass defense for 300 yards and two touchdowns with an 80% completion rate and running for another score in a 21-point win over Baylor. While he’s definitely benefited from other candidates stumbling around him, it would be unfair to write off the redshirt junior’s rise in the Heisman derby as a product of forces beyond his control. Mayfield’s been really good for most of the season: He’s posted a passer rating below 174 only once, ranks second nationally in completion percentage (behind only Washington State’s Luke Falk) and is averaging 1.5 more yards per attempt than he did when he finished in the top four of the Heisman voting last year. If Mayfield gets a seat next to Jackson in New York, he’ll have earned it, even though some voters may have reservations about fully embracing a quarterback helming a fast-paced offense in a league full of teams seemingly allergic to defensive execution. However, one of Mayfield’s teammates who’s buttressed his campaign warrants a mention in this space, too. No wideout has been more productive against Power 5 competition this season than Dede Westbrook, a former junior college transfer who’s registered 1,100 receiving yards and 14 receiving touchdowns over his last seven games while serving as the top threat in Oklahoma’s nation-leading passing offense, according to Football Outsiders’ S&P + metric. A year after Mayfield lost star receiver Sterling Shepard to the NFL, he's found a new top-tier target. 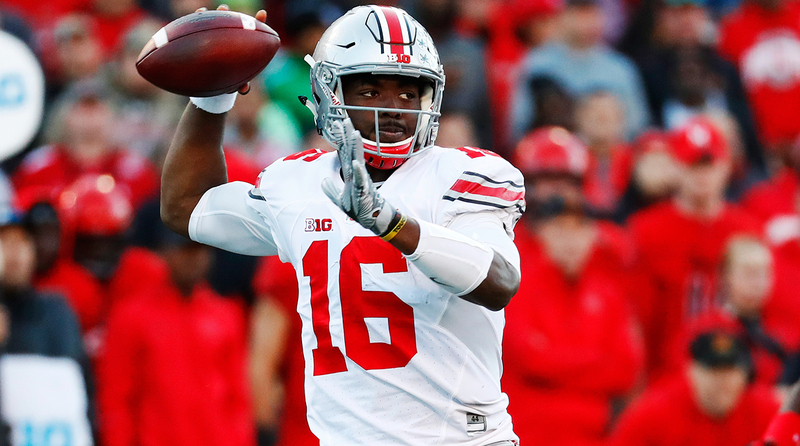 A four-game stretch in October pushed Barrett to the periphery of the Heisman conversation, but only one of the results over that stretch, a three-point loss at Penn State, meaningfully damaged his campaign. He certainly didn’t help himself with ho-hum passing efforts in wins over Indiana, Wisconsin and Northwestern, but Barrett could fall back on his designation as the most visible player on a popular national championship pick as well as a glowing track record that includes a top-five finish in the Heisman voting. Whereas other candidates on lower-profile teams who hadn’t experienced the spotlight prior to this season may have faded into obscurity, Barrett treaded water, waiting to jump back into the mix when other players faltered. Like a popular musical artist who releases a dud of an album but still generates excitement with the impending debut of a new single a year later, you expected a lot from Barrett even though he disappointed in the recent past. It took only two games for Barrett to reassert his position near the top of the Heisman food chain. Consecutive 62–3 wins over conference opponents (Nebraska last week, Maryland this week) catapulted Barrett ahead of quarterbacks leading two other national championship contenders (Washington’s Browning, Clemson’s Watson). The most encouraging part of Barrett’s ascent is that he hasn’t even played his most important game yet. No remaining contest has the potential to sway the electorate more than Ohio State’s meeting with Michigan on Nov. 26. If Barrett shreds the Wolverines’ ferocious defense to bolster the Buckeyes’ bid to become the first non-league champion to make the playoff*, he could cement himself as the clear No. 2 in the race behind Jackson. *Assuming Penn State wins remaining conference games against Rutgers and Michigan State, Ohio State won’t play in the Big Ten title game if it beats Michigan by virtue of the Nittany Lions holding the head-to-head tiebreaker over the Buckeyes. The Heisman bump Barrett receives because of the program he plays for is dwarfed by the wave of support Hurts is getting thanks to his status as the leader of the latest iteration of the Alabama death machine. Earlier this season it was easy to dismiss Hurts as a game-manager whose value derived, more than anything else, from his ability to not screw up. Yet there were flashes of brilliance interspersed within the first two months of his 2016 campaign, including a 273-yard, four-touchdown clinic against Arkansas and a ground-heavy takedown of Tennessee. On Saturday, Hurts elevated his game to a new level, completing a season-high 75.7% of his throws for 347 yards with four touchdowns and adding 100 rushing yards and another score in a 51–3 victory over Mississippi State. The level of competition (the Bulldogs rank 68th in defensive S&P) suggests it’s still probably too early to count on Hurts to deliver in such a big way on the regular. And it’s extremely unlikely that Hurts can draw enough support at this stage to seriously challenge Jackson for the Heisman, even if the Louisville quarterback nosedives in remaining games against Houston and Kentucky. Still, if you were wondering what Hurts might look like in a couple of years, fully weaponized at the control of an uptempo offense with no freshman training wheels, the Mississippi State game might have offered a preview. Instead of entering 2017 needing to settle another quarterback battle, Alabama will roll into Week 1 with a shrewd playmaker ready for a major sophomore leap at the top of the depth chart. Is there anything more destructive to a quarterback’s Heisman campaign than being outplayed by an opposing passer in a double-digit home loss? That’s what happened to Browning on Saturday at Husky Stadium, when he registered season lows in completion percentage (47.2) and passer rating (105.7) and tossed a season-high two interceptions in a 26–13 defeat at the hands of a USC team propelled by redshirt freshman Sam Darnold. The contrast between Browning scrambling to escape pressure and heaving throws to well-covered receivers downfield and Darnold cooly picking apart the Huskies’ secondary was jarring. The portion of the electorate that actually watches games on the West Coast won’t forget it, no matter how well Browning performs in crucial upcoming matchups with Arizona State and Washington State. The egg Browning laid against the Trojans would have sufficed to disqualify most quarterbacks from the chase for the most coveted individual honor in college sports. Browning deserves a chance to redeem himself, though. The sophomore has been awesome for the balance of the season, and it was only a week ago that he was tracking toward smashing Russell Wilson’s record for passing efficiency. His showing against USC leaves a big stain on his résumé, but there’s a lot of good stuff on there too that can’t be ignored. Browning can prove the game against the Trojans was an anomalous blip rather than evidence of a late-season decline by torching the Sun Devils and Cougars over the next two weeks.